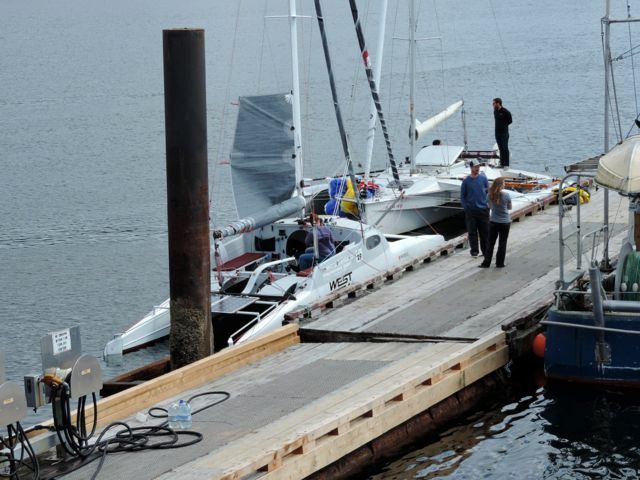 “...a bit of a blur” is the first thing Russell says about his Race to Alaska experience. It was also, interesting, fun, and educational. Educational because he started the race with one big concern; that he did not know the boat well enough. To him, that was the only really "crazy" thing about his entry. Leading up to the race, he had been changing and rebuilding many things including an entirely new rig, built from a naked carbon spar up. He made changes to some of the basic systems; steering, rigging, of course, plus new pedal drive, electrical, and, well, the list is long. 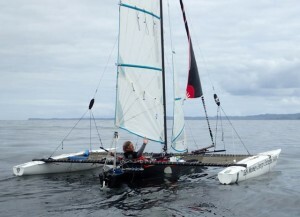 WEST SYSTEM INC sponsored the boat with a new set of sails designed for the new rig. By the time the race started, Russell had only one overnight shakedown and a mere number of hours with the new rig and sails. Before the rebuild, we had sailed the boat a few times but never far. “750” miles (as the crow flies) is one way to get to know a boat. 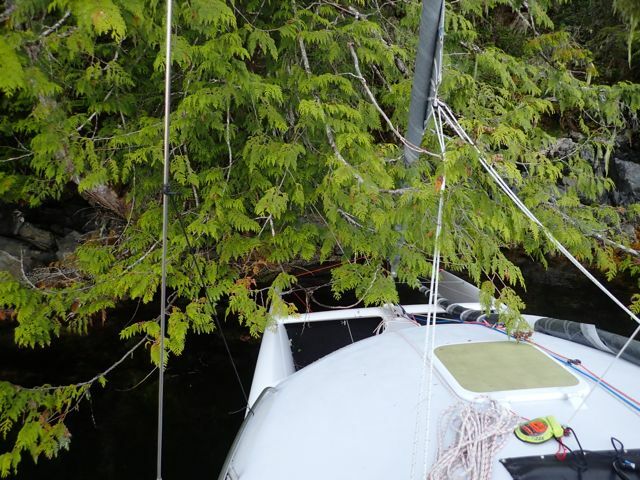 On the first day he learned that even though the pedal drive worked well and pushed this 32ft catamaran around 3 knots, fighting current and tide rips was a rather painful misery and could be dangerous to one’s well being, especially when trying to avoid a reef. 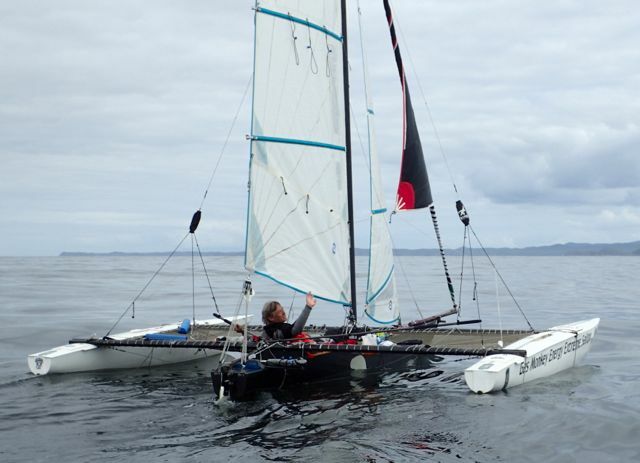 On the second day, light winds and confused seas shook the crap out of the rig and crew, exhausting to the point of realizing that pushing too hard was not worth destroying the boat or its captain. He had almost caught up to the lead boats at the end of the second day but it was then he decided to back off. 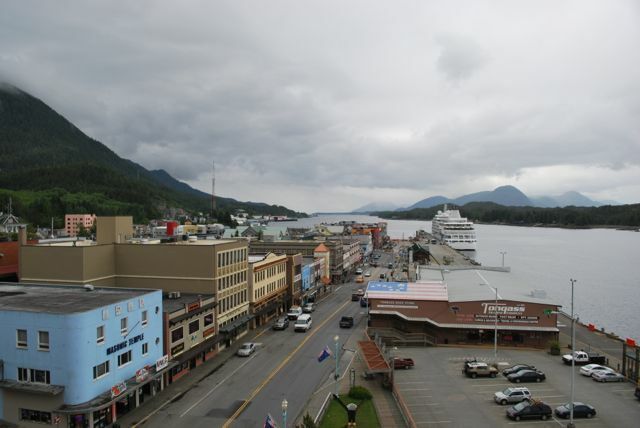 The goal was to survive and make it to Ketchikan in tact. “Regrets’? 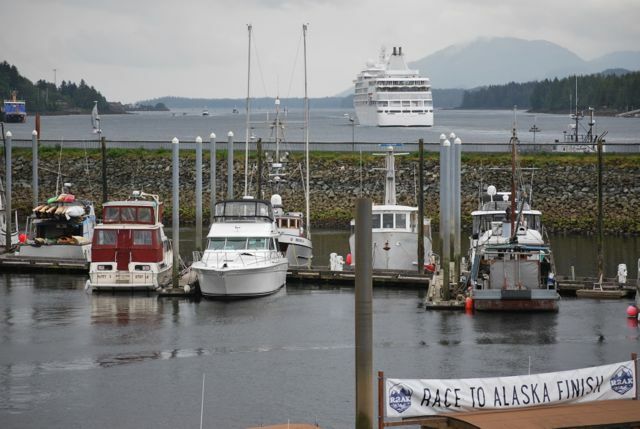 Mostly that he left False Bay too late and missed 2 ‘gates’ through Seymour Narrows, the second of which was simply too dark with cruise ship traffic, heavy rain, and hazards not worth risking. 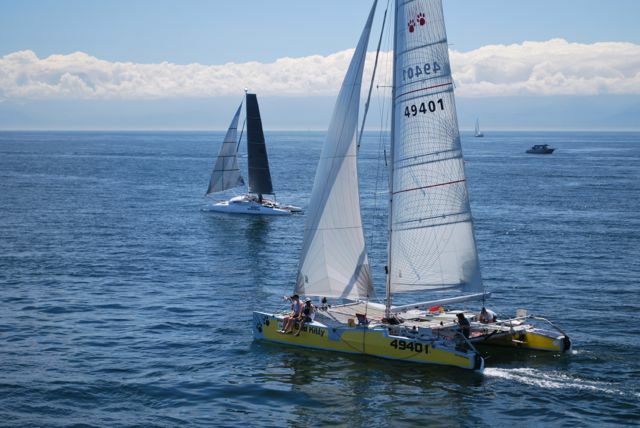 Had he not missed the tide, he could have kept a smaller margin between himself and the leading boats. 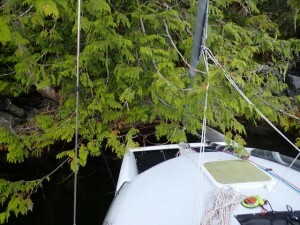 During the rest of the trip, Russell was focused on keeping the boat upright, avoiding logs, making miles, maintaining things on board, and getting rest at night so that he was actually having fun. Fun, is a keyword here. "It is the most fun race course ever". Tactically, visually, Canada’s nature, other racers, all make it awesome. What us 'armchair racers' could not deduce, and may never fully grasp from the tracker, were the conditions that the racers were dealing with, but the leap frog happening that first week, made me smile. I, for one, grumbled watching other boats pass Russell as he rested at night, only to cheer as he passed most of them the next day. When he saw those boats, he steered close to them to say hi. 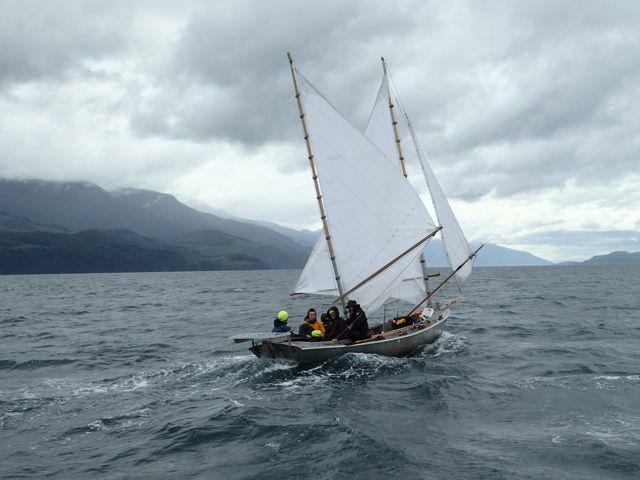 He passed Team North to Alaska twice and was really impressed by their crew. Teams West Coast Wild Ones and Triceratops impressed him too. Seeing young people doing such a cool thing as the R2AK really struck him as positively significant in our digitally monopolized world. His ‘nemesis’ of sorts was Roger Mann; the man and record to beat. Roger was in motion a lot more hours than Russell was and he let Russell know that he felt the need to push harder knowing he had competition. Roger finished only 7 hours after Russell and his personal experience was quite literally, mind boggling. Russell finished almost 4 days ahead of the standing solo record, previously set by Roger Mann in 2015. Team PT Watercraft and Triceratops at the dock in Bella Bella. Unlike a lot of the boats, Russell did not have connectivity to Facebook or the tracker. Being inclined to 'hermit-hood', “it was a good thing” he was not aware of how many people were actually following him on the tracker. Beyond visuals, he had no idea where other boats were or who was ahead of or behind him. VHF weather was his primary source and with updates just twice a day, gales predicted early, sometimes petered out. He sought protected anchorages, at least once, miles out of his way, only to discover the predictions had changed. Then he had miles to make up in the morning with barely any wind and contrary current. Places to anchor with shallow enough water exist on the course but it required planning ahead and sometimes stopping early to use them. Mostly a paper chart kind of guy, Russell also made good use of the Navionics charts I downloaded onto an old iPad. It turned out to be a good tool though we question its tide information. Even when the Navionics claimed positive current, the GPS showed 1.5 - 2.5 knots contrary. This fact highlights the very real nuances of water flow along this course. Team PT Watercraft approaching the finish line amidst cruise ship and fishing boat traffic. click to enlarge. Russell is not a confident videographer but he did manage to take some good clips. He even tried once to narrate but the audio is overrun by wind noise. After a particularly fast and wet day, he set the camera up facing himself to chug his satisfied last sip of beer. 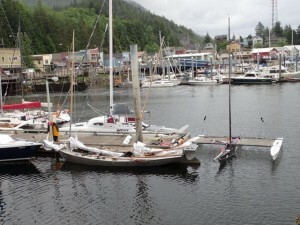 He launched into Dixon Entrance the following day, sailing into Thomas Basin, Ketchikan, at the polite time of cocktail hour after an intense crossing of well over 100 miles. His reward: beer, cheer, and big hug from me. He had asked me to wait until he passed Bella Bella before buying my ticket to Ketchikan, which I stressed about but did, and barely arrived less than 2 hours before he did. Whew! I put together a Video HERE and one of our return voyage will follow in a few weeks. Many thanks again to WEST SYSTEM and other sponsors/contributors listed below. 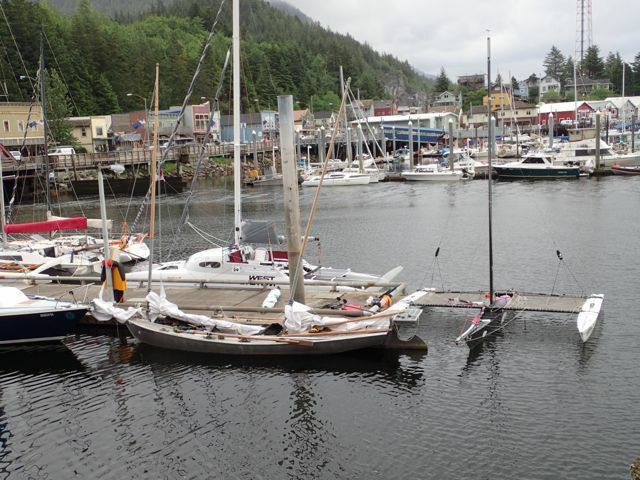 Also many thanks to Ole in Ketchikan, and all of the great people at the Ketchikan Yacht Club (more about their greatness later). Race Boss and all the racer greeters- thank you so much for being there. 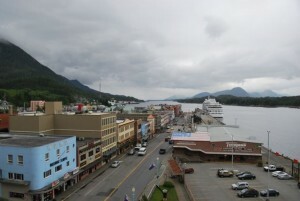 Ketchikan-most of the cruise ships had left for the day. 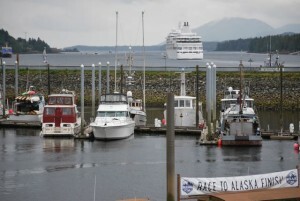 As a final (or not) note: in Ketchikan, Russell declared that doing the R2AK once was enough. Three weeks later, as we crossed the Straights of Juan De Fuca toward home, he was musing about what he would do different next time... Parents out there, does that sound familiar? as in childbirth syndrome? I now think I know how partners must feel sometimes... both dread and excitement at the thought of a repeat performance. We will keep you posted.